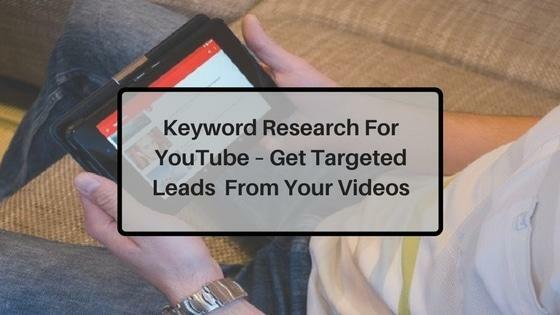 YouTube reaches over 230 million people per month, so it’s no secret that figuring out how to use keyword research for YouTube as a marketing tool can really be a game changer for almost any business. The problem is, many people go about YouTube all wrong. That’s really what recording a video with no particular “problem” or keyword in mind is like. You’re creating content before you really know what the best topic is for you to target. For bloggers, it’s a recipe for posting content that gets buried in the trillions of pages Google indexes. For YouTubers, it means a video that probably gets very few views and, in turn, very few leads for your business. Put simply, you don’t just film videos first and perform YouTube keyword search second — that’s just backwards. And that, my friend, is exactly what we’ll discuss today. The good news is, doing keyword research for YouTube isn’t as tedious as it sounds. With tools like Long Tail Pro, you can probably get it over and done with in one sitting. 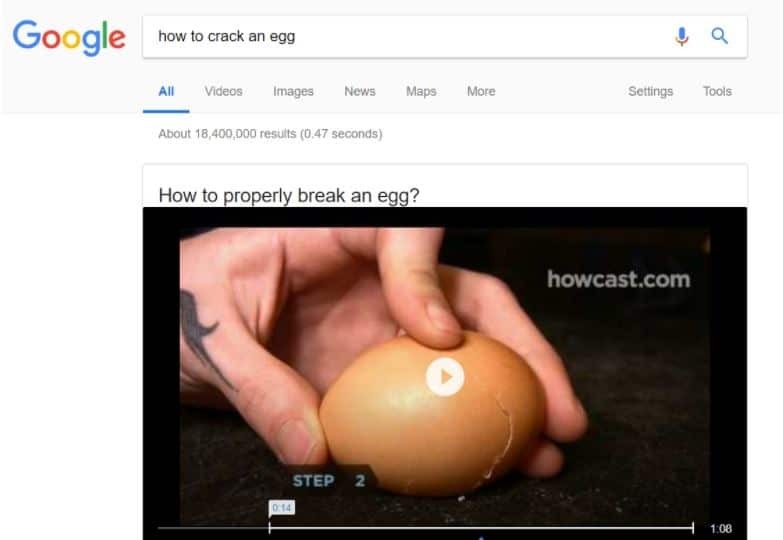 Remember, apart from users who search for videos on YouTube itself, there are also those who discover videos straight from Google SERPs or Search Engine Results Pages. ReelSEO referenced a study that found that 55% of Google searches contain video results. Of those, 80% are videos posted on YouTube. The point is, people don’t need to be on YouTube in order to find your video. So doing the same kind of keyword research for those specific, long tail keywords makes a lot of sense when it comes to YouTube as well. Now that we know what people are actually searching for is an important first step, how do you figure out what they are searching for? What better way to fulfill our goal than to use the built-in YouTube keyword generator itself? Yes — I’m talking about the YouTube suggestions that automatically expand what you type into the search field. 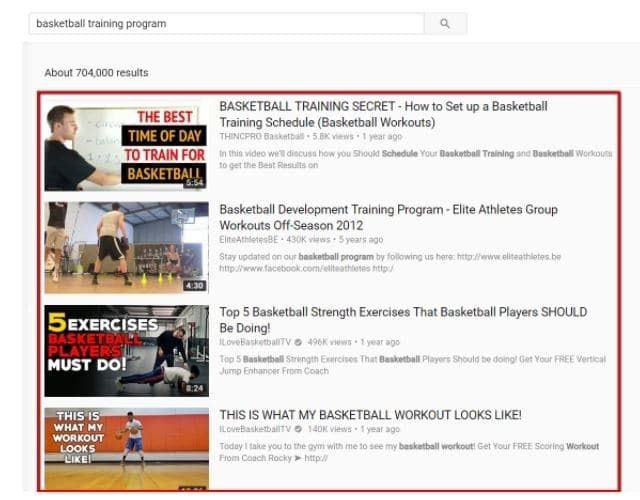 Using YouTube’s suggestions is something we’ve done with Long Tail Pro and it’s guaranteed to be effective, specifically for extracting “seed keyword” ideas. It’s also very easy to apply the principle to your business. The exact strategy actually came from a couple of guys who built a huge YouTube channel about basketball (ILoveBasketballTV is their YouTube channel). Specifically, one guy who goes by “Coach Rock” would use YouTube to provide really specific tips on how to jump higher, shoot better, and much more. You can read more about their strategy here. In short, you’d type in a word or phrase that your audience is very interested in. Something that is your bread and butter. 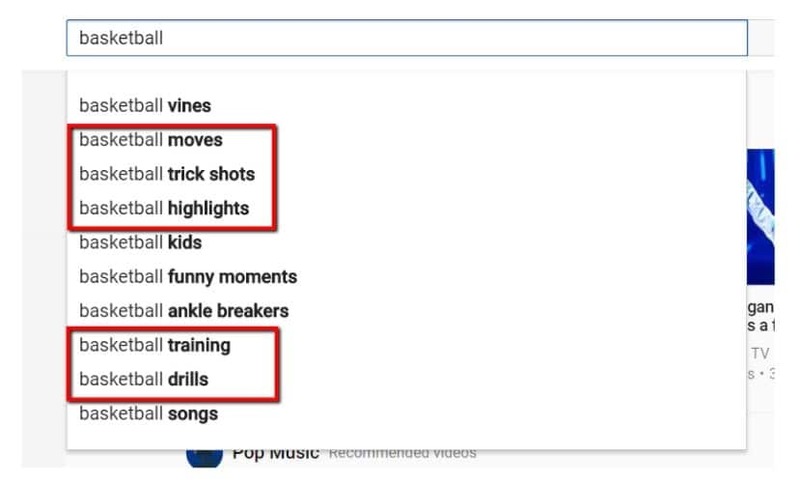 Then, you simply take note of all the suggested searches YouTube provides and those become topics for your videos. 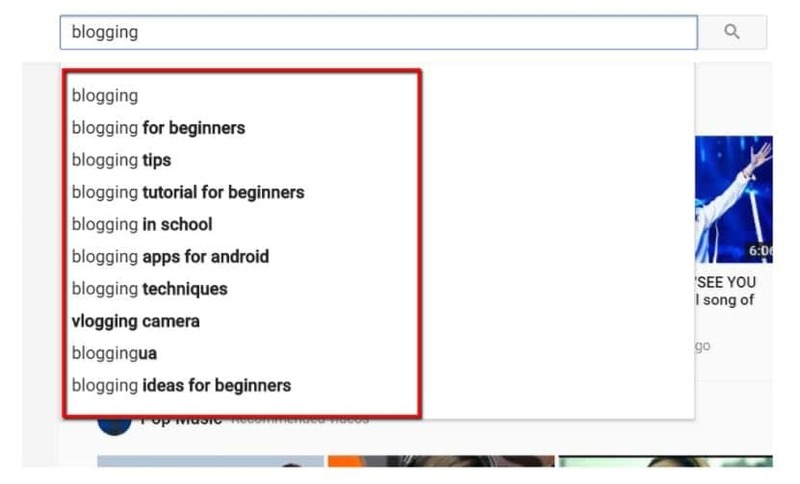 So out of this, I might create one video that focuses solely on “blogging apps for Android” and another that is about “blogging for beginners”, etc. This way, you can address the topic very directly and ideally link to a lead magnet or page on your website that is very closely related to the topic. “Stealing” from your competition is a pretty common and effective strategy in blogging. 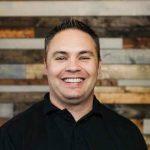 Brian Dean teaches the Skyscraper Technique where you find the most popular posts in your niche, make something better, then reach out to everyone who links to your competitor and let them know you’ve built something better. 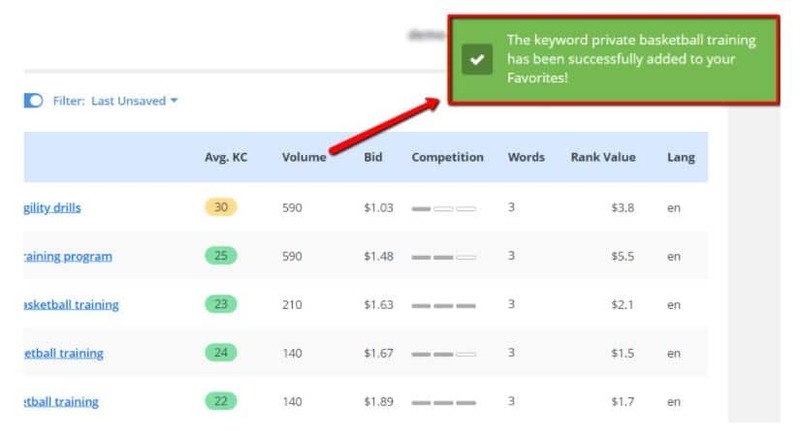 We’ve written about using a tool like SEMRush to discover what keywords your competitors rank for and then create content also targeted towards that keyword. 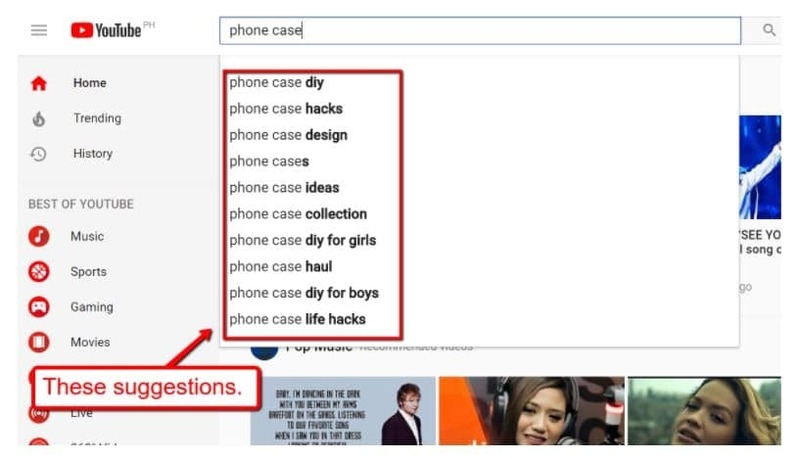 You can apply these same concepts for YouTube’s keyword research. Look at the channels of your competitors or of similar businesses and see what is working best for them. From there, you should not be stealing their content – but you should be looking for some keywords that pop out and give you ideas for videos you can create. In the screenshot above from the ILoveBasketballTV page, maybe I see that the video about Kyrie Irving’s ball handling is doing well – so I decide to create my own videos showing how to emulate different moves that Kyrie Irving is known for. We mentioned earlier that YouTube videos show up quite often in the search results on Google. So, using Long Tail Pro as your YouTube keyword search tool to find keyword ideas, particularly low competition long tail keywords, is definitely a strategy that applies to YouTube as well. What’s more, when you find an excellent keyword you may want to create BOTH a blog post and a YouTube video focused on that keyword. This gives you additional opportunities to rank and pull in traffic from both Google and YouTube, plus you should be able to record a video without too much extra effort since you’ve already done the research and outline when writing your blog post. Do you remember how to use YouTube suggestions to obtain seed keyword ideas? Good — do it now and find up to five seed keywords you’d like to use. Don’t relax just yet. 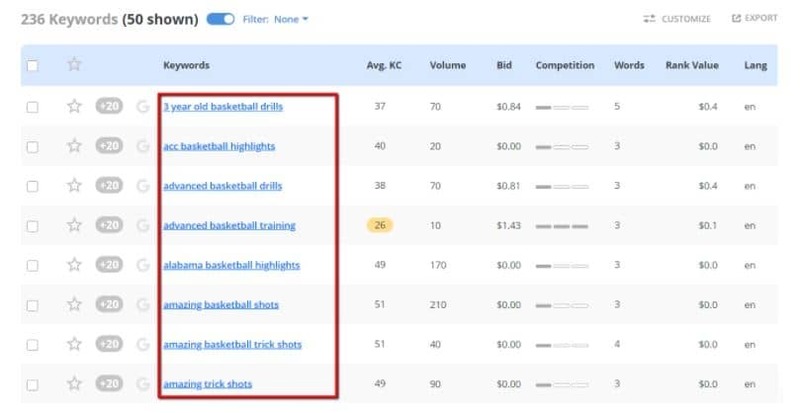 While you can probably spot a couple of keyword ideas that can be utilized for your next video, you still need to know how to determine their potential in terms of drawing in traffic. Everybody knows that going for the most popular keyword is a bad idea. Unless you’re fairly big in your niche yourself, creating content driven by a highly competitive keyword is like adding a needle to a stack of needles. That’s why you need to shoot for keyword suggestions from the low-medium competition bracket. 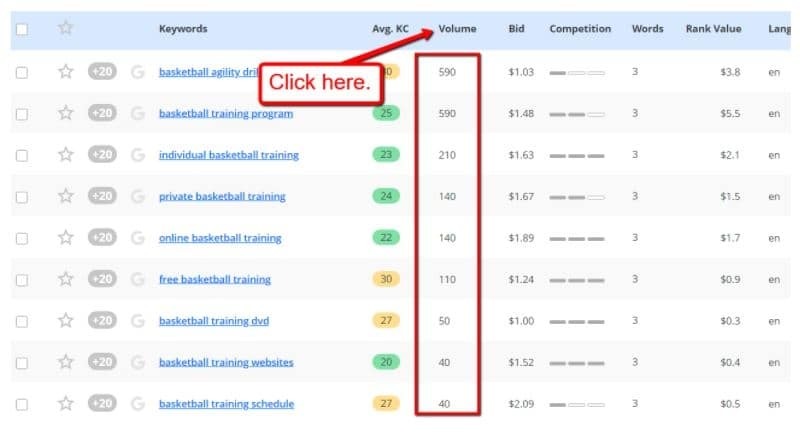 In Long Tail Pro, a keyword’s average competitiveness (shown as “Avg. KC”) is measured on a scale of 1 to 100. Low-medium competition keywords are those with an Avg. KC of 30 or below. If you’re trying to find keywords for SEO purposes, don’t forget to add your domain to have Long Tail Pro gauge its ranking power. Doing so will cause the tool to automatically adjust the suggested Avg. KC in your keyword research. 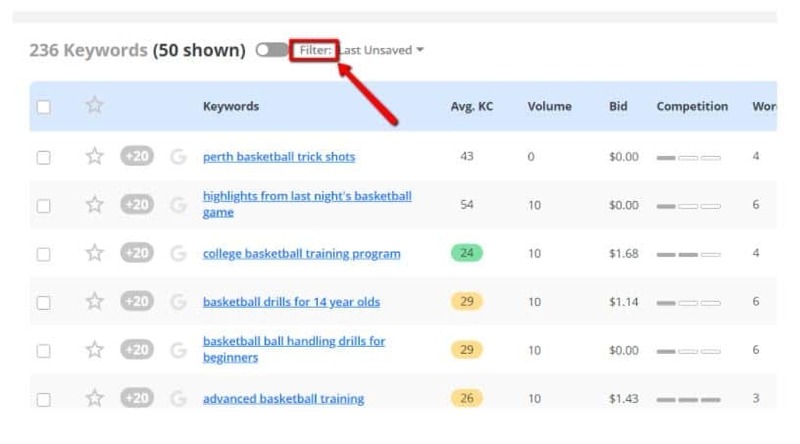 What this filter does is pick out the keyword suggestions with an Avg. 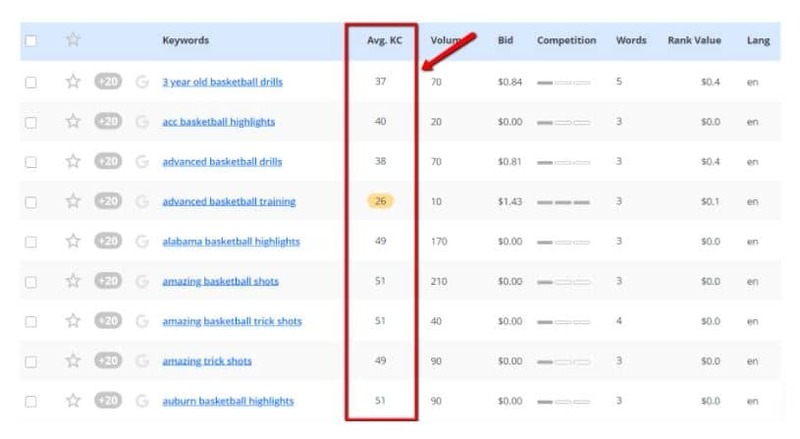 KC of less than 31, which is the sweet spot if you want to find low-medium competition keywords. At this point, you’re ready to sort keywords according to their search volume. You don’t need to be a rocket scientist to know that this metric pertains to a keyword’s popularity in search engines. As such, it can also reflect the traffic potential of the YouTube video or any other form of content you’re about to develop. 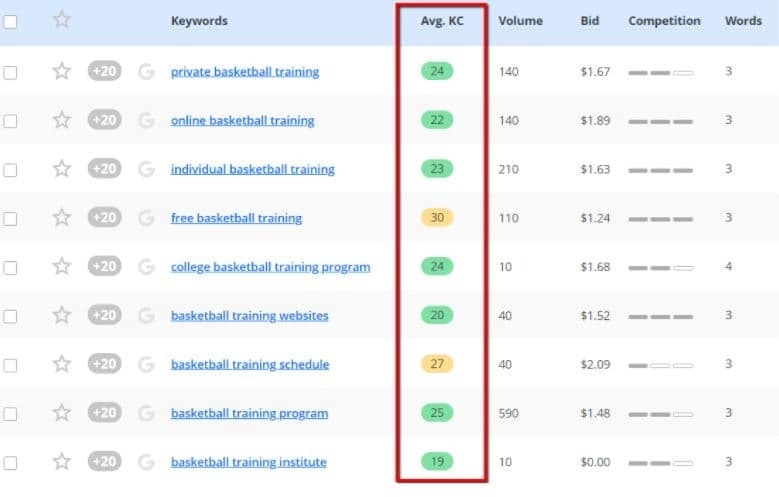 In the screenshot above, it’s clear that the keywords “basketball agility drills” and “basketball training program” have the highest demand out of the bunch. Whatever you do, don’t blatantly rip existing videos off and only use them for inspiration. If you’re in the right niche, you should be able to come up with a few ideas that are different, yet target the same keyword as your competitors. Before you close Long Tail Pro and start working on your next video, don’t forget to create a quick list of potential keywords for your next content. A small popup notification should appear on the upper-right corner of the screen, which confirms that the keyword is now added to your favorites. Ready to start finding keywords? Click Here to take a 7-day free trial of Long Tail Pro and find out what your customers are searching for on Google. As we wrap up, I want to reemphasize another point Jon made in the video at the beginning of this post. One of the biggest reasons for targeting specific keywords with your YouTube content is because it allows you to solve a specific problem. When you do that, you have a much better opportunity to make a relevant offer to the person watching the video and increase your chances of converting them into a lead. By targeting a specific keyword, you can also deliver a specific offer and be confident that the viewer will be interested in it. Whether you are just beginning with YouTube or you already have an established channel, this advice is pretty simple to run with. Start finding longer, more specific keyword ideas for YouTube and then build your videos to hone in on those exact things. Then, make sure the offer you are making in the video is going to be relevant – not something too generic for that topic. No need to over-complicate things – just get out there and start. Check out Long Tail Pro for your FREE 7-day trial! Searching the phrase you want to use in your title in an incognito window will give you the results unbiased with your previous research or preferences, also looking at who is ranking and how old the content is and if they have a large following will help you understand if you can actually attract views from search results or if they got lots of views from their established community. I’m happy to see LongTailPro coming back with some content marketing like this! Youtube SEO / Keyword research in LTP has been pretty confusing but this does a good job of summarizing it. 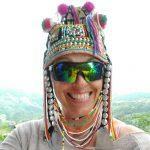 Thanks for this indepth Blog post. Love it. As there is no good keyword research tool out there to do keyword research for youtube, it would be really cool to have such option in long tail pro. Love LTP. being using it for years now. Thanks for the feedback Sajjad! Forgive me but, If I am trying to rank the keyword on youtube .com shouldn’t that be where I need to be completetive, rather than my own domain? Worth a read! The Youtube Keyword Research method you mentioned here, it’s pretty easy and top-notch accurate. Yes, Youtube is the best place to market products that need a demonstration. Thanks a lot writing such a wonderful article. I have used Tuberank Jeet which is the most important tool in my SEO.It helps me to find the best keywords that can generate more traffic. One of the biggest problems i had was finding the best keywords. I didn’t know where to find keywords when i needed them. There were some times where i spent 3-4 hours and couldn’t find the right keywords. Thank You for this amazing article. Really helped me a lot. I learned a lot of new ways to find keywords. Thanks David! Glad it has helped! The same keywords that are used for Google can often times be used to rank for videos as well.